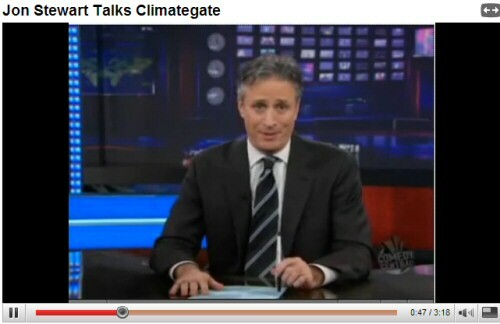 Now it's serious, Daily Show's Jon Stewart mocks Gore and Global Warming | Watts Up With That? I recall seeing a recent poll or news story where many of the under 25 crowd don’t pay much attention to TV news, but they watch Jon Stewart’s Daily Show. Should be interesting to see how this plays out. December 2, 2009 in Climategate. UNKNOWN FOX NEWS ANNOUNCER): The scientists say they kept something called “value added data”. The White House on Monday made exceptionally clear that it wants nothing to do with the furor over documents that global warming skeptics say prove the phenomenon is not a threat. There’s been a very noticeable shift in the run-up to Copenhagen. What’s more surprising is that Piers Corbyn of Weather Action plc made some spot-on predictions of extreme weather in the UK and elsewhere (I think 83% accuracy of many predictions), 100 days ahead to within 24 hours. And he thinks carbon dioxide-based warming is total unadulterated BS. He uses some technique called SWT, based on analysis of the wider atmosphere/earthly magnetic field parameters…. Where I think this has to go now is to set up a series of ‘challenges’ where the different protagonists are required to make predictions about a variety of things. These must be highlighted across the media, interest must be maintained and the results must be announced. Clearly, this is like an election. And we all know about ballot box stuffing, suborning of officials, all the usual Western Democracy ways of cheating the popular will. But it seems to me that the next decade must be independent arbiters setting the rules for the challenges for the two sides and God/Nature/The Weather delivering the verdict. Not CRU or GISS. Not NCDC or the BBC. Not Weather Action or the Heartland Institute. THE WEATHER. And the Earth’s climate systems. Now is that less likely to happen that professional soccer ridding itself of professional gambling syndicates?? And how many protagonists will secretly be starting geoengineering projects to influence the debate in their favour eh? You think some lefties would be wacko enough to deliberately RAISE temperatures to win the argument?? I continue to hold Jon Stewart in high regard. One of the few people out there willing to tell it like it is on a show with a large following. It’s about time Gangster Gore was publicly mocked in this fashion. Cool. Internet has outdated peer review as we know it. Future peer review will, in important matters, be peer reviewed by the internet. The dark ages of dishonest peer review is history. Can CLIMATEGATE be a sort of a spring in the debate in climate science? Things are changing!! Real debate arises. Looks like someone hacked Foreign Policy magazine too. From the brains behind Iran’s Green Revolution to the economic Cassandra who actually did have a crystal ball, they had the big ideas that shaped our world in 2009. Read on to see the 100 minds that mattered most in the year that was. for ending the debate over whether climate change matters. As the link between human activity and climate change becomes conventional wisdom and governments work urgently to establish a global climate treaty, Pachauri deserves no small amount of credit for creating such an extraordinary shift in public opinion. Pachauri, an engineering and economics Ph.D., has since 2002 chaired the U.N. Intergovernmental Panel on Climate Change, which was the co-recipient of the Nobel Peace Prize with Al Gore in 2007. Since then, Pachauri has raised the specter of large-scale population displacement and the existential threat that global warming poses to low-lying island nations, while arguing that large, industrializing countries such as China and India will not act on the issue before the Western world curbs its own greenhouse gas emissions. He has also backed the adoption of extremely ambitious emissions cuts, recently recommending that atmospheric carbon dioxide concentrations be kept below 350 parts per million. Any progress toward thwarting climate change this year owes a great deal to Pachauri. Best idea of 2009: Vegetarianism as a means to reduce greenhouse gas emissions. Worst idea of 2009: Bailout with large payments to those who have caused today’s economic crisis. This is the equivalent of LBJ realizing that if he lost Walter Cronkite that he had lost the ‘Mercan people. Folks, that thing disappearing in the rear view mirror was that oft mentioned tipping point……………..
Huh? Sounds like a bowling alley in here. Oh, that’s just all those heads rolling. That’s not the point at all, is it? We need the taxes to support our grand and not-so-grand plans. We are sure the Sun will rise in the East for another few years and as long as it does – you pay. Argghh. I published a comment in British press not to look for MSM or “jon Stewart – US comic” to use the leaks, because they’re on the alarmist payroll. Do I feel rotten? No. Jon’s been hacking at “deniers” for a long, long time. It is nice to see Jon’s writers acknowledge one of the biggest stories in the news. Kinda hard to ignore the ratings numbers Anthony has been getting. Which is in part how comedy writers gauge their material will get laughs. What’s going on is Jon has begun to tap the incredibly deep well of comedic material the whole “global war-ming-the-unmerciful” represents. And the huge young audience anxious to see authoritarians caught with their collective hand in the cookie jar. There is another bizarre twist in the release of damning files from the Climatic Research Unit (CRU) at the University of East Anglia known as ‘climategate’. It is the biggest deception in history but the story and arguments of how the material was obtained, its credibility and significance have diverted attention from the real scientific issue. Global Warming and not even Climate Change is needed for Copenhagen, just a green agenda. None could disagree on a cleaner environment and that will be the win-win agenda, that for sure, they have just chosen after “Climategate”. It explains this comedian’s behaviour. Anyway, big Al is the big loser now. PBS continues to disappoint me. On the day the story broke, they reported “greenhouse gas highest ever” It would have been news if they weren’t. When the Aussies voted down their bill, and Phil jones stepped down, they ran a special on how AWG had directly put many farmers in Austalia out of business. It will be interesting how long they stonewall. Science has been hijacked by socialists masquerading as politicians. How much money will now be spent to formulate the real answer that can withstand a true balanced peer review? Is all the money that has been spent now wasted on a lie? What about the Cabon trading credits that have been traded in Europe? Should they be given back? This is a huge mess that will likely make the lawyers boatloads of money suing each other. There has been another instance on Melbourne ABC radio of a program presenter dismissing the CRU email revelations. Jeff Richardson, one of the Coodabeen Champions, presented last Monday’s edition of 774 ABC Melbourne’s evening program. He appeared to be in denial over the importance of the hacked or leaked emails. Richardson joins Jon Faine who last week denied the significance of the emails and admitted that he had deliberately censored coverage of the issue on his program. Taking talkback on Monday night, Richardson told “Joseph of Port Melbourne” that he was “flogging a bit of a dead horse” when the caller referred to the Climategate scandal. Joseph asked Richardson if he had looked into the CRU emails. “That’s been covered extensively in the mainstream media, Joseph, so I think you’re flogging a bit of a dead horse there,” Richardson said before immediately moving on to the next caller. Apart from his obvious reluctance to engage and discuss the issue, it was interesting, from the way he referred to it, that Richardson didn’t seem to consider the ABC to be part of the “mainstream media”. Thankfully, millions of Australians don’t either. That’s weird: did we watch the same video? In the one I just watched, John Stewart said scientists shouldn’t be making it any easier for climate change doubters like Inhofe to peddle their nonsense. John Stewart making a joke doesn’t = John Stewart mocking global warming. I searched for ‘climategate’ on YouTube and got 1740 results! Not bad after a week and a bit. Actually quite rational. If there’s going to be a two trillion dollar market in carbon credits, we want London to be the place where the trading happens. Imagine a 5% cut on all of those deals? It would be enough to buy ALL of our soldiers Kevlar body armour… and more! Remember, it’s no more of a scam than derivatives and other such impenetrable financial instruments are. If the con is on, we’re going to tax it. Think there’s a little conflict of interest there with one arm of UEA spinning up a whole new ‘product’ that another will then be making money teaching people to manage? Stewart has acknowledged Climategate which is fantastic but how about having someone like Lindzen on the show? JonesII – problem is that the environmentalists have been riding the coat-tails of the Carbon Boondoggle for so long that a lot of folks have forgotten about the real, rational things. Climategate is an affair that leaves this skeptic with mixed feelings. The upside is that confirmation of being right is a damned good feeling. But there is shame and disgust in the reaffirmation that western society is as corrupt, blind and venal as the church in Galileo’s time. He claimed AGW is real,I don’t see how he helped the debate any,I got the impression the whole segment was set up to discredit Inhofe.”Don’t worry folks,we may have a couple of bad scientists,but the science is settled”.Do these people all get together and work out a strategy? Perhaps we’re seeing scepticism about the anthropogenicity of climate change start to replace blind faith in it. Jon is wrong when he says inhofe’s remarks to Boxer were before he read the emails.Watch the whole clip and you’ll see. Paraphrasing an article I saw about academia went like this. Our generation is not learning about scientific innovation that comes sometimes from outside the established elite scientists.Outside innovation is suppressed by academia and generally ignored by a lazy media. Meanwhile a blizzard of high-tech simulation is presented as real science to a growing generation.Science is becoming virtual reality. Some of our understanding has been contrived like a computer game. This is what seems to have been going on and I am sure the same things are happening in other areas of science like astronomy and physics. to Rhys Jaggar – I like your idea of the prophetic challenge. Ever read the tale of Elijah and the prophets of Baal? Somewhat similar circumstances, similar solution. I really like the way that one ends, btw. To Indiana Bones – I disagree that Stewart is on any AGW “payroll.” Now it’s no surprise that he’s going to go along with whatever seems hip or cool to “in” crowd, but he got where he is by being a very good barometer of public opinion. (all successful comedians have to be) When he starts to notice the potential to rip open weakness on the part of the AGW defenders, he’s going to go after it because that’s what he does. The real key is social – once it becomes acceptable to question “global warming” out loud and in public, the entire rotten edifice is going to come crashing down. The BBC are asking for your comments for a debate they are planning at Copenhagen. You may wish to contribute. Remember to mention the polar bears! But.. but he still ended with the consensus view. Most of it was wonderful to watch, however he left the audience with the idea (even though he just explained how the data was corrupt) that AGW is true. His attitude is this email thingy is giving the bad people ammunition. Stewart’s attitude is just like Dan Rather in memogate. Ya – the memos maybe false but what they say is true. I thought that statement was irony, although I guess it can be interpreted in either direction depending on your own views. I wonder why the lamestream media is losing money hand over fist. Could it have anything to do with the fact that a major story is now part of the popular culture and there’s been nary a peep about it by their talking heads? Well, so far so good for the warmists. Jon Stewart’s demographics are mainly the non-voting kind. When the formerly big three (ABC, NBC, & CBS) start covering the story, hang it up. Their demographics include the older, voting kind. BTW, Elmer and the boys at Minnesotans For Global Warming are doing a fantastic job of growing the AGW Counter Culture! I’m surprised. Last time Gore was on his show, Jon practically sucked his…and never asked a single hard question or challenged any answer. The answer, Noelene, is yes. Be in control of both sides of any argument then you never (really) lose. It’s the way all important events are handled. Mark, your disgust is warranted and, IMO, accurate. Michelle Malkin surveys the damage so far. “My syndicated column today looks at the global warming cultists in the Obama administration who are working overtime to paper over the ClimateGate scandal. Yesterday, Phil Jones, the head of the U.K.’s Climatic Research Unit at the University of East Anglia stepped aside while the university investigates. Penn State prof Michael Mann, purveyor of the infamous hockey stick graph of spiking global temperatures peddled by Al Gore, is also under investigation. GOP Sen. James Inhofe, vigilant watchdog over global warming shenanigans, wants Babs Boxer to investigate. As Obama heads to Copenhagen to crusade for massive interventions to stop global warming, a new Harris Poll shows a significant shift in public opinion away from the cult of climate change. Jonah Goldberg dissects the groupthink that has gripped the global warming industry and its media enablers. Ed Driscoll takes you on a tour through global warming evolution in six and a half minutes. Well now: “Moderate” (liberal) GOP candidates/lawmakers led by GOP cap-and-tax 8′er Mark Kirk are running as fast as they can from the global warming hot mess. Now it’s serious indeed – Jon Stewart’s Daily Show has been a citadel of liberal agenda. I’m afraid to say that most of his viewers probably regard the Daily Show as their primary news source. I say great, we are getting exposure of the problem, regardless of what Stewart says. It is lifting the veil off the problem, the younger people will now google Climategate and find the conservative view. Why? Because the conservatives have 95% of the entire posts on the issue. The liberals ignored the issue, and therfore have no posts for Google to find. Therefore the only information that the people can find is our view points. Stewart plays a comic game, even mocking us, but ultimately we win. Jon Stewart still touted AGW and acted as though it is a fact. Ah, maybe make that “COLLECTIVIST HAND”? I recall seeing a recent poll or news story where many of the under 25 crowd don’t pay much attention to TV news, but they watch Jon Stewart’s Daily Show. (Exception — I did happen to see Beck’s excellent interview of Anthony independently of Stewart’s show! There must be a lot of programmers out there who are looking at the CRU code and data sets and thinking “I could build something better than that!”. There is also an urgent need to sort out just which parts of it are useful and which parts are junk. So maybe what we really need right now is an open source climate-modelling project, with the goal of building a really robust climate model using the same approach that produced software like Apache and Linux. I’m sure there are plenty of open-minded scientists and expert programmers who would be willing to donate their time, and peer-review by thousands of volunteers would soon grind out the bugs. Everything would be open, so there would be no room for groupthink or deception. I suspect that a project like this would be able to produce something more robust than the CRU random hockey stick generator in an amazingly short time. Unfortunately the show ends with the statement that Global Warming is real and makes Senator Inhofe look like a fool. It’s not funny, not honest and delusional. He is feeding his public with the wrong conclusions. This is not a “contribution” to our case. Jim (09:15:00): Things we can live without: 1. New Scientist. Indeed. I read the latest New Scientist editorial today, “personal emails”, “climate change deniers”, “no evidence in hundreds of emails”. I think I may cancel my New Scientist subscription today. I am NOT a climate change denier, climate is changing as always, AND I think that CO2 will lead to increased temperature, but not as much as the AGW supporters think, more along the estimates of Dr. Lindzen. New Scientist cannot continue to use the terms “climate change denier”, “climate change sceptic”; no one is claiming that the climate is not changing. We are debating for and against AGW. You can state that Dr. Richard Lindzen at MIT is a leading AGW critic and that Dr. Michael E. Mann is a leading AGW supporter. Got that New Scientist? They’re right. The emails are “out of context” or “tacky” or “represent nothing more than poor judgement.” Yep. Sweep under the rug. Move on, nothing here to see. Evidence of real wrongdoing will be discovered in the released computer code files. This cannot be “out of context.” It’s proof of real manipulation of the data. Too bad he isn’t bright enough to realize that if the warming is debunked that the cause of any so called related sea rise is also debunked and that maybe the polar bears are dying because there are now so many that they are over running their food source… they probably need a predator to help balance the polar bear “over population” problem… oops, I forgot, it was government policy that created the polar bear population explosion that is now evidenced by their dying off from starvation. In nature, over population is balanced by predation, or starvation… it works perfectly. Also, most people don’t realize that polar bears are water creatures and are as at home in the water as they are on land. So called melting ice is not the problem. Liberal and conservative are vocabulary words that have totally lost meaning. They are just words to keep us in our respective boxes and at each others throats. I am a liberal (by my definition, obviously not the definition that most here use to disparage the word) that is a AGW skeptic. In the world of boxes, that does not compute. Get out of the habit of staying in anyone box. Seek the truth wing not the right or left. Cromagnum: Hopefully WE will win. The script has not given itself away just yet. Being that you have insider insight from conversations with the principals involved, why don’t you tell us how they were released, instead of letting commenters continue to flog the meme that they were “stolen” by “denialist hackers”? I watched the whole video and thought it was fair. What more does the truth need? I’m not a lawyer, but I think there are grounds for a class action suit against Gore. That’s based on the showing of his scare movie to public school students. Did your child have to go the therapy, or does your child have nightmares because of this forced viewing? The movie was made for the specific purpose of scaring people, and the public school administrators who mandated it should be taken to task. The creator of the hoax needs to be held accountable. The Green section now features a huge story at the top of the page by Katherine Goldstein which features a slideshow supposedly exposing “The 7 Biggest Lies About the ‘Global Warming Hoax’.” However, even many of their own readers aren’t buying the lame excuses presented as you will see here. Thank you so much Australia !!! Ron de Han, its not the message – its the fact that he is even covering it. The data from 1871 to 1893 is missing. I have contacted the CDIAC requesting the whereabouts of the missing station data from George E. Noonan, whom I have researched locally. He did exist, collected the temp & precip. for both Weaverville and La Grange Placer mine (Trinity County) and was also a pharmacist in town from 1859 onwards. Our historical society had the precipitation data to 1869 from George. Let’s see what kind of transparency will emerge post ClimateGate Change. I proposed this on the Tips and Notes page a couple days ago. Great minds think alike good sir! Jon Stewart has a few of the dots in front of him: “using a trick” to “hide a decline”, and “throwing out raw data” in favor of “value added data” (he really had fun with that one). Maybe if he could just add a few more, and started, oh I don’t know, connecting them, a lightbulb would go off and he would realize there is a veritable comedy gold mine sitting there just waiting for him in mocking and poking fun at the Warmists. Making fun of “Deniers” is so yesterday. Global Warming and freedom of speech have long had an uneasy relationship. Why do climate deniers hold sway in Australia? 6th-10th Dec. is a Red Weather Warning period of DISRUPTIVE weather (Solar Weather Impact Period, SWIP) especially 6/7th & 9-10th of Heavy blustery rain or sleet turning to snow or blizzards with bitter winds at times in parts of the region – likely to hit worst around President Obama’s visit to Denmark & Norway (8th -10th). 11th-13th Dec will be mostly cold but less windy with lower precipitation and be foggy & misty at times. 14th-16/17th Dec will have more snow showers which will turn heavy with biting cold winds. Around 17/18th is likely to have snow flurries & stay cold near summit end. Denmark / Copenhagen weather is expected to turn milder in the days just after the summit end. The audience’s laughter did seem a bit subdued. Keep working the Fortran Computer Code. This is where the real story is. Plug in the known data sets and publish a comparison “graph blinker”superimposed over the previous ones. This will show the deception where the common man can understand. Read my post above yours. We have to go and find old newspapers and historical citations for when temp. records began at stations. Then we know what’s missing, and dig/demand for it. These and many, many more all for the low price of $15 USD or 4,000,000 carbon credits (the price of carbon credits is dropping rapidly). And for the editors of popular scientific journals that backed AGW, we have a special deal too hot for the internet. Please call us collect at URSCREWED and we will rush you our can’t fail brochure. And if you’re willing to travel and we haven’t found you a job in 10 years, we guarantee to get you a job shoveling snow in North Florida. 0.001% of your fee will go to the Climategate 44 legal fund. Legal Disclaimer: We guarantee to protect your legal rights by restricting correspondence to phone/paper only, using non-governmental mail services (avoids mail fraud), and destoying all originals. The people watching TDS are the same ones watching David Letterman when AL Gore is on there, cheering when he says his tripe. THis is just entertainment, nothing more nor less. Ron de Haan (09:42:24): This is not a “contribution” to our case. But even more important than that, “The Daily Show” addressing this subject is a clear indication that ClimateGate is not going away any time soon. All we need now is for “Saturday Night Live” to start mocking Al Gore along with this entire pathetic scam, and we can say goodbye to cap and trade. Hey the date on the calendar is also changing; in case you haven’t noticed. If any climate scientist out there; heck, I’ll open it up to non-climate scientists as well; well if you’re a non-scientist feel free to join in; anybody at all, who has any peer reviewed observational data, or maybe just a wikipedia citation; hey I’ll take a plausible rumor citing any two times (or more even) in the entire 4.5 billion or so years of earth history; recorded or not, when it is known that the earth’s climate was exactly the same. Hey I’ll even take weather as a proxy for climate for a short time. If you have data of two instances completely lacking in climate/weather change between them (anywhere on earth); let’s hear about it. I’d prefer that the two instances didn’t occur on the same day; let’s say no closer than 30 days between them. The world is awaiting revelation of a time when climate didn’t change. I think this was touched on here at Watts a week or so ago. All the discussion has been about natural sinks such as vegetation and the oceans but I think there’s also another factor that would correlate the addition of CO2 to the amount that is removed from the atmosphere to help keep the ratio fairly steady. Of course this would have to be measured and quantified, but CO2 dissolves in raindrops and if rain increases with increased CO2 then so would the amount of CO2 removed from the atmosphere. UK TV media is finally opening discussion on the climate change. Both BBC–SE and Channel 4, within the last hour, had live confrontation between representatives of both camps. >>> “Climategate is an attack on man-made global warming scientists.(sic)”. Michael Mann, Penn State University meteorology professor, said Climategate is an attack on man-made global warming scientists. “I think it is unfortunate that some scientists out there are using this situation to settle personal scores, to settle a vendetta,” Mann said, in an exclusive interview with AccuWeather.com’s Katie Fehlinger. Mann said that the e-mail leak happened just in time for the Dec. 7, 2009, United Nations Climate Change Conference in Copenhagen, where world leaders, including President Obama, hope to come to an agreement on a framework for future international climate change mitigation. Despite skepticism, Mann insisted that global warming is real. Mann needs to step down. And somebody should call for him to do so, while Penn State investigates. Nobody manufactured those emails or data, except CRU. He’s implicated on 1/4 of them, just for starters. My friend took my web-site recommendation! Snifff! I got somebody to visit here. Snifff… Sorry. I think I have something in my eye. Why has the counter for numer of views on the Stewart video stopped? It’s been showing 305 for a long time now…. Jon Stewart is a satirist and his humor will come from any news source. It’s palpable that the MSM media like CNN are painfully picking up a story which was broken here and a few other blogs more than a week ago. I like Jon Stewart’s satire. He makes liberals and conservatives uncomfortable and laugh at themselves. Looks like Mann has become a conspiracy theorist. Interesting response to my earlier post on realclimate. Another commenter pointed out that Gavin’s dismissive response to my post (Gavin 2: “Feel free to ignore anything I have to say on the subject then.”), was to what he says now (Gavin 2), or what he said in the past (Gavin 1: “My information is that it was a hack into their backup mailserver.”). Gavin 1: You stated “My information is that it was a hack into their backup mailserver.” Can you reveal the source of your information? Have you been interviewed yet in the investigation? Have you revealed the source’s name to the police investigators or are you witholding evidence that would help solve this heinous crime that has the “alarmists” up in arms? Gavin 2: Regarding “Feel free to ignore anything I have to say on the subject then.” Should we then infer that Gavin 1 is just repeating what he’d read on WUWT or CA and promulgating a false meme to stoke the “alarmist”? Gavin 3: Given these concerns with Gavin 1 & 2, shouldn’t you be directing Gavin 2’s statement to the “alarmist” to advise them to ignore anything Gavin 1 said regarding the “stolen” meme? One natural archive of weather data are the microfilm records from major newspapers. Most of them had a weather feature every day that reported the official national weather service high and low, along with in many cases mid town temperatures. That is an archive that is untouchable by folks that like to manipulate data, and verifiable by anyone who has access to a large library. A few hundred volunteers could assemble a data set from these records. For reliability have 2 or more individuals (unknown to each other) assemble data for each location, then compare their input to verify accurate transcription. This would work for the major cities and parts of the world that have been served by long lived newspapers. I am sure there are other similar temperature records that could be assembled as well. “It is not a coincidence… that this event happened in the weeks leading up to the summit in Copenhagen,” said Mann. Nope, it sure isn’t, and paybacks are like revenge, they make thier own motive-gravy. How many people did CRU put the screws to? Now, Copenhagen must go down in transparency. We already know who knew what and when. Someone is fiddling with YouTube’s numbers of the viewing of Jon Stewart’s take on Climategate. There no change in the number viewing when I go back after a half hour. Still only 305 but …140 viewers rated the video and 155 made comments. One popular past video of Stewart had 158K viewing and 2.4 K ratings. Other checks show that only 1 or 2 % who view, rate the video and few, very few leave comments. If they can hold down the viewing numbers, it won’t be listed as a popular viewed video. Does Phil Jones or Al Gore have a seat on the Board of YouTube? 3) The only crime that Gavin can entertain is that of “denialist hackers” stealing data from CRU — oblivious to other possible crimes that the police might be investigating at CRU. Due to the heavy volume of responses, we are no longer accepting collect calls. Climate Gate 3rd item (after Afghanistan and Iran events) on the main 10 o’clock news. Earlier Ch4 news too. The science is settled and Climate Change won’t effect the consensus. May I have a big, big laugh at this laughable statement. They are going to swallow every word they have said!!!!!!!!! How Jon Stewart shapes the news and reframes climategate reveals his beliefs and thus bias about AGW. Of course they do. I actually saw this in action when the company I worked for was the victim of a high profile nationwide publicity campaign supposedly started by a NH grade school teacher. It blew up in one week a month before our TV ads were to air. We all know a single person can not do that unless someone with a lot of power is behind them. They certainly can’t do it in a high profile nationwide publicity campaign in a week. This is what is actually going on. So yes the news is controlled by the bankers at least in the USA. AGW is all about another scam so the financiers can make money off the poor and middle class. Here in the USA 100% of our taxes goes to pay off the interest on the “loans” the banks make to the US government. Loans of fairy dust since the Federal Reserve creates the money for the loan and the US treasury prints it. The whole blasted thing is a scam. Central banking, taxes and now this. AGW is being used to legitimize another scam and provide a reason for the ultra wealthy bankers to set up a world government ruled by them. Since they are not idiots they want to leave people thinking they are still living in democracies with a say in how they are ruled which is an illusion as the bank bailouts in 1933 and again in 2008-9 proved. This statement from the United States FDA shows how Americans no longer control the making of their laws. Copenhagen will just make matters worse. This is actually utter hog wash but after over ten years very few people, especially Congress critters, are going to remember the exact provisions of the WTO treaty and that those provisions mean the USA is NOT required to change or pass laws to comply with the WTO demands. Aren’t the SOBs sneaky? “In ratifying and implementing the WTO trade agreements, Congress expressly stipulated that “nothing in this Act shall be construed…to amend or modify any law of the United States, including any law relating to…the protection of human, animal, or plant life or health.” from the Uruguay Round Agreements Act, Pub. L. No. 103-465, Sec. 102(a)(2), 108 Stat. 4809, 4815 (1994) (codified at 19 U.S.C. Sec. 3512), as cited in Lucinda Sikes, supra note 16, at 332. I am very much afraid we will get this Copenhagen Agreement rammed down our throats one way or another because “They” want “Global Governance” Heck Al Gore’s buddy, Maurice Strong, father of the environmental and global warming movement, is a member of the UN commission on Global Governance. It has been dressed up as socialism, humanitarianism and environmentalism but dig down to the ones who are orchestrating the media, UN, NGOs our politicians and scientists and you find what “They” really want is a worldwide totalitarian government. Any bets we soon see politicians trying to “regulate” the internet ? Sorry I missed your post – agreed! So… how do we get this together? Anthony, any chance we could make this a cooperative effort with the SurfaceStations.org project? Also, I would like some guidance as to whom I should be making requests to. There is a tangled mess of agencies, USHCN, GHCN, GISS, NCDC, CDIAC etc. Looks like Jon’s seen the ratings and has the Darwinian imperative – he’s going to have to backpedal on a lot of issues and fast to retain his audience. He became the most painfully transparent Dem propaganda outlet for a while there. How has climate science moved on since governments decided to make a new global agreement on climate change two years ago? J.S. is not a painfully transparent Dem propaganda outlet. That is his role to play in what Gail C. accurately described –scripted and planned propaganda for the masses. His job is to diffuse honest anger — either against Bush or against the truth of AGW. His program did not refute AGW, quite the contrary. It becomes very transparent once you escape from the right or left box you are processing info from. FOX is not an honest broker either. It’s just their turn to lead the opposition. “…..All the discussion has been about natural sinks such as vegetation and the oceans but I think there’s also another factor that would correlate the addition of CO2 to the amount that is removed from the atmosphere to help keep the ratio fairly steady. Of course this would have to be measured and quantified, but CO2 dissolves in raindrops and if rain increases with increased CO2 then so would the amount of CO2 removed from the atmosphere….. Yes and then it dissolves limestone and forms caves. There is an awful lot of limestone out there and I have traveled through only a tiny fraction so far… 9 countries and 17 states. Is this the same White House that believes the economy is sound and improvements are happening? “One natural archive of weather data are the microfilm records from major newspapers. Most of them had a weather feature every day that reported the official national weather service high and low, along with in many cases mid town temperatures. That is an archive that is untouchable by folks that like to manipulate data, and verifiable by anyone who has access to a large library. “A few hundred volunteers could assemble a data set from these records. For reliability have 2 or more individuals (unknown to each other) assemble data for each location, then compare their input to verify accurate transcription. A much better source is an online site where you can do keyword searches way back into the past through hundreds (maybe thousands by now) of newspapers, mostly from the US & Canada. Once you’ve set up your search template on the search page, you can search through a long time series of a paper and harvest the hits, then click on them one at a time to go straight to the temperature data for the day. (Note–the site is a bit awkward and cranky and there are tricks to navigating it and using the search feature that take time to learn. Also, I haven’t done a temperature search myself–I’m drawing on my experience with searching for other material.) It’s a good tool for researching many topics. Colbert’s interview with Esty was much better with 20% extra more truthiness. Gee I wonder if one of those “practical courses” includes lessons on how to harness horses and oxen, and hitch and drive a freight wagon so you can get your product to your customers. Turning corners with a team and especially docking takes a bit of skill. Perhaps Neil Dimmock could teach the module. If our world leaders are really serious about “the goal of achieving at least 50% reduction of global emissions by 2050.” This is the lost art we need to regain. Will Al Gore lead the way by giving up his limos and airplanes and restrict his travel to horse drawn vehicles? The U-tube spoof could be wickedly funny. I wish I had the expertize to do it. Down the Memory Hole and Jon Stewart’s chemistry background. There are 3,560 short videos of Jon Stewart on YouTube so copy right issues should not keep off the Jon Stewart clip on Climategate. Yesterday, the JimInhofePressOffice clip had 350 viewers which is a fraction of the number actually viewed based on ratings and comments. Today, it lists 61K hits. Perhaps my phone call to Inhofe’s office yesterday to check the incorrect viewing numbers made a difference or the “hide the increase hits” computer program was not working. Please continue to circulate the video clip. Jon Stewart’s (Stuart Leibowitz) father, Don Leibowitz was a physcist at the RCA Laboratories in Princeton and Jon majored in Chemistry at William and Mary for 2 years before switching to Psychology. Perhaps his early scientific training has made him sceptical about AGW. Having him mock AGW and CRU heralds a major sea change in opinion. This is just sad. I wonder from the comments above if anyone bothered to watch this to the end. I would have thought the statement made by Stewart at (2:10) “Does it disprove global warming, no of course not” Or this: “but it does put a fresh set energizers in the senates resident denier bunny” regarding Inhofe “that guy thinks global warming is debunked every time he drinks a slushy and gets a brain freeze. Remind me again who Jon Stewart is mocking?